Malawian President Peter Mutharika has fired his Minister of Agriculture, Irrigation and Water Development Dr George Chaponda over the maize scandal involving Dora Siliya and Edgar Lungu in Zambia. 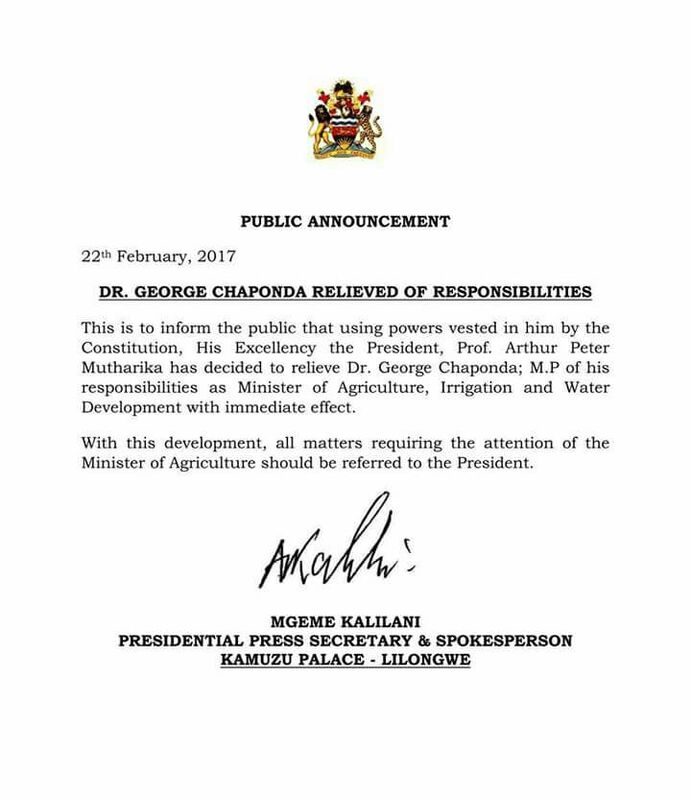 According to a letter dated 22nd February 2017 and signed by Mutharika’s Spokesperson Mgeme Kalilani, Dr Chaponda has been relieved of his duties with immediate effect. Though the letter does not give details, the firing comes shortly after investigative wings raided Chaponda’s house and found huge amounts of US Dollars and Malawian Kwacha. Equally searched was the house for Foster Milumbe, the Chief Executive Officer for the State Produce Trader Agricultural Development and Marketing Corporation(ADMARC). Chaponda and Milumbe are being investigated by the Malawian anti graft body over the maizegate scandal involving the corrupt purchase of maize from Zambia. Zambia’s Agriculture Minister Dora Siliya and President Lungu are also involved in the scandal. Lungu’s Spokesperson Amos Chanda recently lied that President Mutharika had told President Lungu that the government investigations in Malawi did not find any evidence of corruption involved in the maize deal.